In the virtual world you are going to come across infinite number of platforms that offer travel coupons, daily deals on a variety of products and many other lucrative offers on almost everything that we need. By buying these deals the consumers can save a lot of money and that have contributed to there growing popularity among all. The web designing and creative designing sector was one niche where this marketing strategy was not used until the introduction of the mightydeals.com. This online forum was established by the joint initiative of professional web designers, who has previously introduced the viral blog WebDesignerDepot.com which publishes the trending news on web designing techniques. The inspiration came when they realized that there are no particular online shops for the web designers from where they can buy different web designing tools like templates, brushes, icons and other such products at a competitive price and save up a lot of money. Therefore, they took up the initiative to personally contact the publishers of these creative tools and sign up the best deals with them which they can offer to the designers. Thus the deals available on this platform are absolutely exclusive and you are not going to get them on any other platform. The deals offered in this platform keep up with its name “mighty deals” in the true sense of the term. The discounts offered on various products start at 15% and it can increase up to as much as 90%. All the deals are showcased in this platform are for limited period and so hurry to get the latest ranges of the Photoshop brushes or any other products that you are in need of at the most affordable price. Moreover, some of the deals are only available in specific number so it might become unavailable even before the deal time ends. 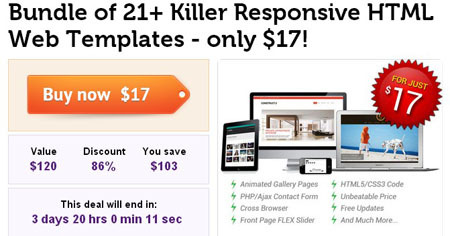 The range of web designing tools available on this platform varies from the latest tutorials, templates, toolkits, varying fonts and many other products. Avail the best deals to get maximum discounts. Latest offers are updated every week so keep your eyes wide open. 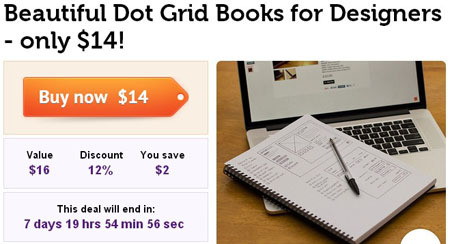 Beautiful Dot Grid Books for Designers – only $14! 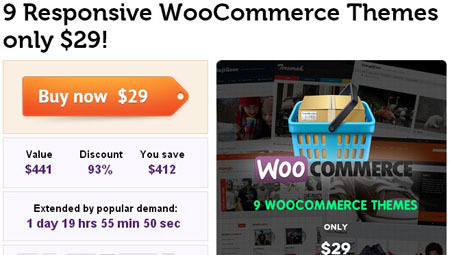 9 Responsive WooCommerce Themes only $29! 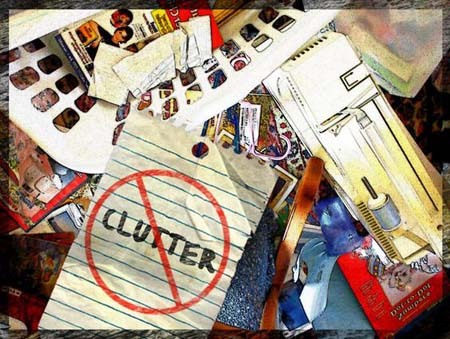 This is one of the best features of this online shop. Browsing through this site regularly for the latest offers is not a feasible option. So the entrepreneurs of this online shop have provided the designers with the opportunity to subscribe for email newsletter about the latest offer. These letters will keep the designers updated about the latest deals on the site so that they come to know about it as soon as possible. The designers can purchase any of the deals available on this platform through PayPal or with the help of plastic money. The moment the payment is clear they will get the software or the code or such things through email which they can easily download and start using. Therefore, mightydeals.com is the one stop shop for professional web designers. The best deals for professionals are available on this platform and now even the designers can feel proud for bagging the greatest bargain.